Additionally, last week I tried to take this photo with an older camera, but all the film disintegrated upon trying to develop the picture. Needless to say we’ve got problems (I mean about reading Ulysses, not about us personally, well...) and the only way we’re going to tackle this one is with a group of capable readers. 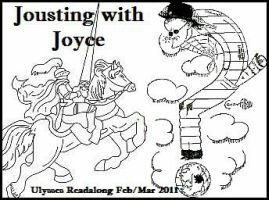 For this reason, it’s with considerable excitement that we’re joining the Ulysses Readalong hosted by Fizzy Thoughts. The fun starts Feb 1st and honestly, it will probably take that long for us to work up the courage. Hopefully, you’ll sign up or at least follow the carnage left behind our progress over the next 2 months! This is on my list, but after "War And Peace" this month I don't believe I'll have the heart to tackle Joyce in February! I can actually hear dramatic music in my head while I look at that picture. Good luck--I'm bracing myself already!